When I was growing up, the basement was the place where the kids hang out. I absolutely loved it. My parents would hardly ever go down there because they knew it was a ‘Kids Area’. All my friends would come over and that’s where we would play and have sleepovers. Looking back, the basement wasn’t really all that great or that kid friendly. All it had was a carpet, tv, some furniture, and a desk. Pretty simple. But there was always room for sleeping bags for all my friends. Now that I’m older, I know not to overlook the importance of having a good basement even though I know I won’t use it too often. It’s really for the kids. This is SERIOUSLY for the kids! 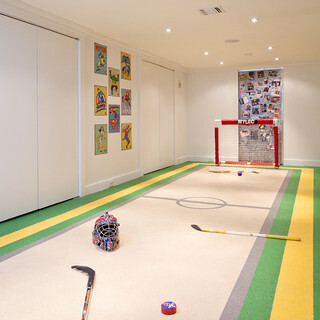 (probably the boys) But wow — with this kind of basement your house will be the ultimate place for sleepovers! Do you have kid rooms? What do they look like? Where are they in your house? Or do you think its better not to have one at all?